The National Rifle Association, one of the most politically powerful advocacy groups in the U.S., begins its annual convention today in Indianapolis, featuring a lineup of Republican governors and senators as speakers and also a planned rally. NRA Vice President Wayne LaPierre said the organization, with its focus on protecting rights of gun owners, had more than 5 million members last May, although such claims in the past by the group had been questioned by the Washington Post’s “Fact Checker” blog. 1 Just as the NRA’s focus has shifted over time from its start as an organization focused on training and marksmanship to one that is a major player in the battle over gun control, the reasons why Americans own guns also have changed. About half (48%) of gun owners said the main reason they owned a gun was for protection, according to a Pew Research Center survey conducted in February 2013. 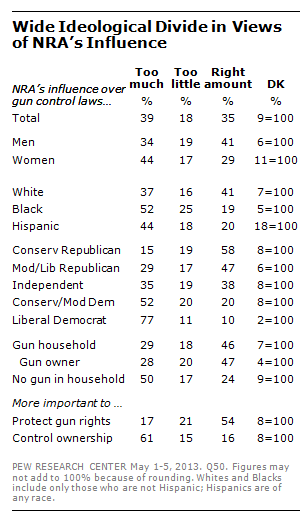 About three-in-ten (32%) said they owned a gun for hunting. 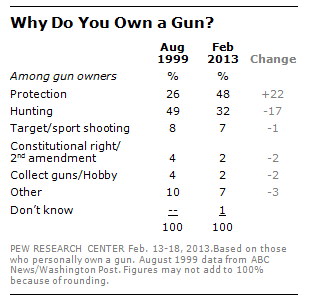 That was a turnaround from 1999 when 49% said they owned a gun for hunting and 26% said they had a gun for protection in an ABC News/Washington Post poll. 2 Despite the NRA’s reputation as a formidable opponent of gun control laws, the public is divided over whether the organization exerts too much influence over whether such laws are passed or not. While 39% held the view that the NRA exerted too much influence, 35% said it was the right amount and 18% said it was too little, according to a survey we conducted last May. An ABC News/Washington Post poll, also conducted last May, found similar results. 3Gun supporters are more politically engaged than gun opponents. Our May 2013 survey found that there was a substantial gap when it came to political involvement between gun control supporters and gun rights advocates, whether NRA members or others. A quarter of those who prioritized gun rights said they had, at some point, contributed money to an organization that took a position on the issue, compared with 6% of gun control supporters. There was less of a gap on other activities, such as contacting public officials or expressing opinions on social media. But when all those activities were combined, gun rights proponents outnumbered gun control supporters by 45% to 26% when it came to those who said they were involved in one or more instances of activism. 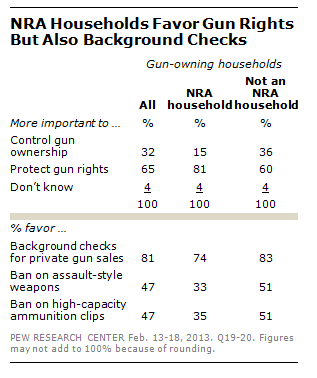 4 Although a measure to expand background checks on gun sales failed in the Senate last year, Americans who live in a household where they or someone else is an NRA member overwhelmingly favored the idea of making private gun sales and sales at gun shows subject to such checks. About three-quarters (74%) backed these expanded checks compared with 26% who opposed them. But far fewer people in NRA households supported proposed bans on assault-style weapons or high-capacity ammunition clips. 5How widespread is gun ownership? Our February 2013 survey found that 37% of adults reported having a gun in their household, with 24% saying they personally owned the gun and 13% saying it was owned by someone else in their home. The survey also found that 58% of people who did not have a gun in their household said that having a gun would make them feel uncomfortable.